This beautiful Ash Miniature Shaker Basket was personally handwoven by Kathleen Becker over a wood mold with fine hand-pounded white ash wood splits and thin white ash weavers as an affordable alternative to my full size Shaker Ash Baskets. This Shaker basket makes an elegant business card holder, and a fine addition to a Shaker basketry or miniature basketry collector! The rims of this miniature ash Shaker basket are hand carved ash, and were formed over a Shaker basket mold for a perfect fit to this basket. The overlaps were tapered and scarfed, using traditional tools and methods. 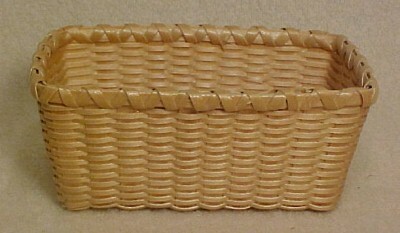 This basket features all of the traditional features of my larger Shaker baskets! The Miniature Ash Shaker Basket, which would make a stunning business card holder, measures 4.5" long x 2.75" wide x 2" high. Signed and dated by the weaver on the base, this basket has been used for display purposes only and is in MINT condition. You can read more about the Shaker's and Shaker Basketry here.